(Reno, NV) – The Northern Nevada Children’s Cancer Foundation (NNCCF) Board of Directors is pleased to announce Shirley Folkins-Roberts as the new Executive Director. She is a long-standing advocate for childhood cancer and was a founding member of the foundation. Folkins-Roberts has been an advocate for children with cancer since 2003 and has a long-standing history with the foundation. 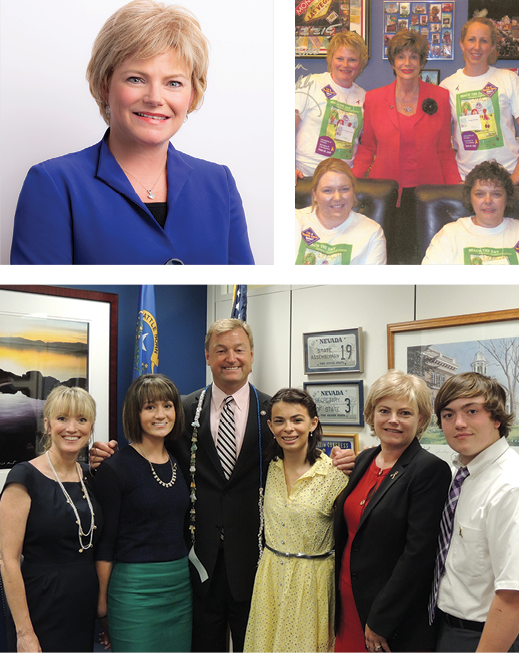 She is a co-founder of NNCCF, served on the Board of Directors, and led teams of Nevada families to Washington D.C. to advocate for childhood cancer research funds. In her Executive Director role at NNCCF, Shirley will continue to procure sponsorships, oversee event logistics, advocate for more research funding, and help northern Nevada families navigate their journey through childhood cancer. “I’m grateful for the opportunity to work with our staff and supporters to fulfill a passion of mine and my family’s as we continue to serve northern Nevada kids in the fight,” said Folkins-Roberts. Shirley comes to NNCCF with a background in northern Nevada’s development industry and worked for Panattoni Development Company. Since 2004, Shirley has been involved in more than three million square feet of commercial real estate development. Shirley earned her Juris Doctor from the McGeorge School of Law at the University of the Pacific and her Bachelor of Arts in Political Science from the University of California, Davis. Shirley became a member of the California Bar in 1993 and the Nevada Bar in 2010 and has practiced with private firms in both states. She is an active member in the community helping organizations and serving on various boards such as Rotary Club of Reno Central and REMSA. The Northern Nevada Children’s Cancer Foundation (NNCCF) is the region’s only nonprofit dedicated to helping local children and families affected by childhood cancer. Its goals are to alleviate the financial and emotional strain of childhood cancer by providing financial assistance, emotional support, advocacy for increased research funds, and awareness of childhood cancer. NNCCF encourages ongoing enrichment for children and young adults diagnosed with cancer through educational and scholarship programs. For more information, call (775) 825-0888, visit www.nvchildrenscancer.org or follow on social media @NVKidsCancer.